A Very Happy and Blessed Thanks Giving to You. Let us start our Thanks -Giving meal with a Prayer. We may start our Thanks-Giving Meal with the seven contemplations, or with whatever traditional grace or prayer you prefer to use to express our gratitude. JAINA has received invitations from various organizations in India for events to be held in month of January and February, 2018. We shall soon publish he same so those who are visiting India can participate in same. JAINA also welcomes suggestions from various members for any new projects they would like to take up in JAINA/ their centers. Please feel free to contact me. Start the Thanks-Giving Meal with the seven contemplations, or with whatever traditional grace or prayer you prefer to use to express our gratitude. May we ask for forgiveness from all living beings that we may have harmed, intentionally or unintentionally. May peace and compassion grow in ourselves and extend to all around us. May we pray that all the people everywhere in the world will avoid inflicting harm on animals and fellow human beings and practice nonviolence and compassion. The Neminath Temple is a Must See. Take a moment to go inside. It is a beautiful and ancient temple. The temple has three levels. We will first go to the basement to see a beautifully carved representation of Neminath’s wedding ceremony. As you enter the temple, walk around and behind the center edifice. There you will see a set of stairs going down. As you walk down, in front of you is a marvelous samovasaran carved out of a single stone. At the bottom of the stairs turn right. Look for 4 pillars that form a wedding stage called chauri or mandap. To identify them, look for two pillars that have pots carved into them, stacked on top of each other. Notice the two pillars across from them don’t have the pots. These four pillars form a square and that is the wedding stage. Now step inside the chauri and look at the ceiling. The frieze on the ceiling depicts Neminath’s wedding. The story is this: when Neminath saw animals being sacrificed for his wedding feast, and when two deer came crying to him, he asked the charioteer to turn around his chariot, abandoned his bride-to-be Rajul, and called off the wedding. He could not stand for such violence and he renounced the world. On one frieze, you can see Neminath on a chariot going towards the wedding stage. The second half of the same frieze shows the chariot turning back. You can see the slaughter of animals and the bride all dressed and waiting for the groom. Can you guess why the second set of pillars does not have the stack of pots? Because it represents an incomplete wedding! 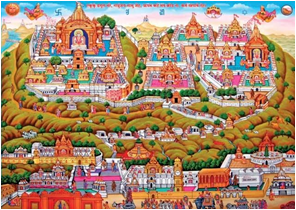 The temple has three nicknames – First, Neminath Chauri - and know you know why! Second, it is known as Vimal Vasahi. 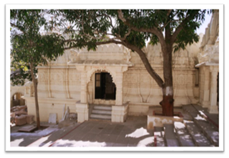 This might be because this temple resembles the Delwara temple in Mount Abu that was built by Vimal Shah. And the third name is Bhul-bhulamni, which means maze. I think you will agree that the layout of the temple is a little confusing and thus the name. Our next stop is another fun spot just around the corner. Do the souls not get great fruit of even a slight worship performed to Lord Jineshvara? To explain : a pumpkin gourd creeper, though small in size, present big fruits to its nourisher. Even a little service to Lord Mahavir brings better results. In this regard the Gujarat King Kumarapala born of Caulukya dynasty and the Staunch devotee of Lord Mahavira is celebrated as an example. There lived a Ksatriya called Jaitra who was surrounded by his servant - plunderers in the slum area situated in Malava region. Though kind by nature used to being in contact with thieves, he looted many caravans & enjoyed additions. Heat the butter in a deep non-stick kadhai, add the capsicum and sauté on a medium flame for 1 minute. Add the tomatoes, chili powder, pav bhaji masala, salt and ½ cup of water, mix well, mash it lightly using a masher and cook on a medium flame for 7 to 8 minutes, while stirring occasionally. Add the green peas, raw bananas and ¾ cup of water, mix well, mash well using a masher and cook on a medium flame for 5 to 7 minutes, while stirring occasionally. Garnish with lemon and coriander and serve immediately with toasted pav and tomato slices. Know how Jain Philosophy describes the way of looking at the world through these 9 Tattvas/Fundamentals.